Cook lentils first by bringing water to a boil and adding lentils. Bring back to a boil. Then reduce heat to low and simmer (uncovered) for about 20 minutes or until lentils are tender. 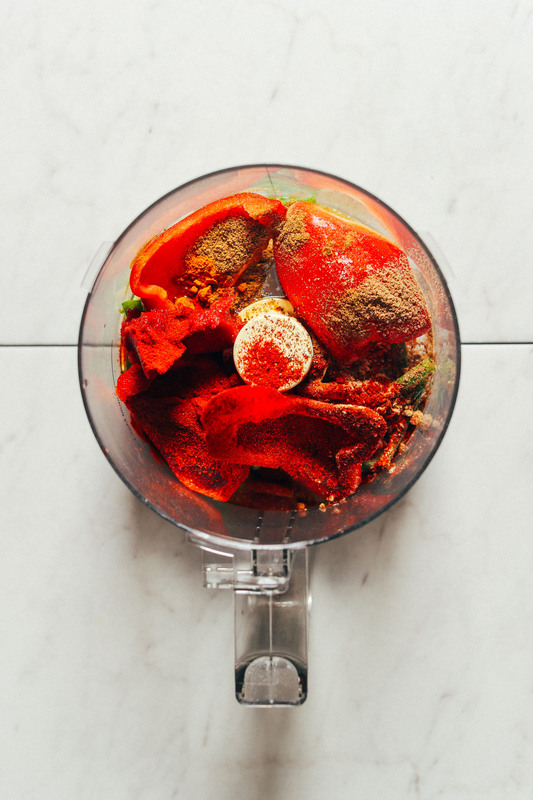 In the meantime, to a food processor or small blender, add garlic*, onion or shallot*, bell pepper, tomato paste, coconut sugar, sea salt, paprika, cumin, coriander, ginger, turmeric, cayenne pepper, and apple cider vinegar. Mix to thoroughly combine. *3 cloves minced garlic is approximately equal to 1 1/2 Tbsp. *Some reviewers have mentioned they would've preferred the garlic and onion / shallot sautéed before adding tot he sauce! Try this out for a more subtle flavor. How many grams is per a serving? We didn’t measure the grams per serving, but the recipe makes 6 servings. Wow, you are a genius! I roasted the pepper with a little olive oil then fried the onions & garlic together before adding all of it to the food processor, but everything else I followed the recipe perfectly & it was amazing!!!! Lots of people complaining about the bitterness haven’t added the sweet ingredient which is crucial to give it the all around magnificent flavour. I made some pearl cous cous (sometimes called Israeli cous cous) then added the lentils & sauce to it – an incredible dish. This is delicious!! The combination of so many spices is something I wouldn’t know how to do on my own, but totally works with instruction. I appreciate that all spice measurements were X Tbs “with more to taste”, since that’s pretty much how all my cooking works, haha. And the guide for adding more flavor based on sweet or heat or acidity, etc., was awesome. Great recipe! I don’t know what I did wrong but mine turned out super bitter 😞 What could have happened? Sorry to hear that, Tatiana! Did you make any modifications? Did you include the tomato paste? Or could any of the ingredients been old? A friend said I probably put more garlic than the amount the recipe asked for. He got reed of the bitterness by adding cinnamon and a bit of greek yogourt. I’ll definitely will make them again. Thank you for your response and for sharing easy and delicious recipes. This recipe was just as delicious (and crazy-simple!) as I remembered it from last year. So flavorful…just perfect! Just finished whizzing this up in the food processor. Delicious! and I haven’t even added the lentils yet. I can adding olives or capers to this for a bit of a different flavor, but I love it as is. I made a double recipe so that I could serve half of the lentils at tomorrow’s party and half for the next day’s dinner as part of the eggplant recipe. Tasting the final product tonight, I felt that there was too much bite from the raw garlic and onion. Since it was too late to sauté those two ingredients before adding to the sauce, I decided to sauté the whole thing, lentils and sance, in a little olive oil. I added a bit more tomato paste and was thrilled with the results. Still spicy but no biting aftertaste. I’m sure our raw food/vegan friends wouldn’t have minded the raw garlic, but I think this will please the crowd. Next time I’ll sauté the onions and garlic before mixing. I made this and added a organic zucchini to the red sauce. I have a toddler so I love sneaking in extra veggies whenever I can! He loves the sauce & it’s a win since it’s has veggies in it. I think that would be delicious, Crystal! Such a delightful recipe! Thank you so much! My family and I loved it! Really clean and easy preparation for an inexpensive dish bursting with flavour! I like that you can also alter the taste by sauteeing the ingredients a little. This was really good! I’ve been trying my hand at yemsir wot lately, and it hasn’t turned out good at all (not sure if you’re into Ethiopian, but I’d definitely try your recipe if you made one – I love all of your recipes). The flavors don’t turn out like at the Ethiopian restaurant, and it always turns out mushy. When I saw this recipe on your site, I knew I had to try it. I cooked the pepper, onion, and garlic down, added the seasonings, and then blended it in the blender. I then added the lentils that I had pressure cooked to the sauce pan, added the blended sauce, and cooked down a bit more (I added some water to the sauce to get it to blend in the blender, so I wanted to cook it off a bit) with some olive oil. I served it with rice, cilantro, and some avocado. I’m going to have to try this sauce technique next time I try yemsir wot, and I’ll use green lentils instead of red. Also, an important note to those that mentioned the bitterness – this is because you left out the sugar/maple syrup. If you do that, there’s nothing to balance out the lemon/ACV. This recipe has complex flavors – if you leave out an important ingredient, it will throw the flavor off for the whole dish. Same thing happens if you leave the sugar out of a Thai curry dish. I too struggled with the bitterness of this dish. It smelled and looked so good…I was really looking forward to getting stuck . But the bitterness killed it. I am not a big fan of the cold sauce being added to the cooked lentils. Felt the sauce just didn’t reach its potential. So…inspired by the wonderful ingredient list, I will attempt this again but with a more traditional cooked approach to the sauce. Your recipe has inspired me to tweak a few things, so thank you!!! I was looking forward to making this for weeks, and was excited to have a weekend at home to try it out. I am a vegetarian and love lentils, am always looking for new ways to prepare them—this definitely looked interesting. Unfortunately, my partner and I both found this recipe super bitter and honestly not at all tasty. The only thing I changed was that I initially omitted the maple syrup because I really dislike sweet flavors in my food; otherwise followed the recipe exactly. I ended up adding the syrup at the end to salvage this because the flavor was so unpleasant—I admit it did help, but I would definitely not make this again as described. I believe the raw onion and garlic are what gave it such a bad taste, so wish I had read through the comments first. Pretty disappointed in this one. Felt I should leave a review so other folks might consider using a different method than described, or skip this one entirely. Sorry to hear that this recipe didn’t do it for you, Rachel.. Better luck with the next one! Hey there, this is Rachel again. I have this recipe 2 stars and don’t see my rating reflected here. Can you please rectify that? The reason I wrote a review was so that I could rate the recipe down so other people would think twice before making it. It’s the only recipe I’ve ever made that I’ve had to compost because it tasted so bad. Thanks! I made this on Tuesday for myself and my boyfriend. It was good – he liked it. But it tasted bitter to me. I think what I would do differently next time is roast the red pepper in olive oil and then blend it all together. I think that would have taken away some of the bitterness. However, I had a lot of leftovers and wanted to use it for a dinner I was cooking for a friend last night so I just heated it up with a little bit of veggie broth, olive oil, and a touch of cinnamon and it turned out perfect!! I served it for us over rosemary couscous with a side salad and a side of braised leeks and it was a fab dinner. She wanted the recipe for these lentils! Will make again but with that adjustment. Also want to try the eggplant recipe with this! Yay! Thanks for sharing, Sue! Loved this! I like that I had most of the ingredients already in my pantry. The flavor was really nice and warm, just a touch of sweet and heat in there with the wonderful spices. We’ll be making this again for sure. We made this with red lentils, so it turned out a little mushy, but I actually liked it that way. It was kind of a deliciously flavored sauce to serve over rice. :) I also decreased the cayenne pepper to a quarter teaspoon since MB’s recipes are always a little spicy for me, and that was just right. We are glad you enjoyed this dish, Elizabeth! I am a wee bit confused. After I cook the lentils and then prepare the sauce, am I then supposed to cook the lentils in the sauce for a period of time? Or merely adding the cold sauce to the cooked lentils at which point this recipe is complete? Hi Elissa! 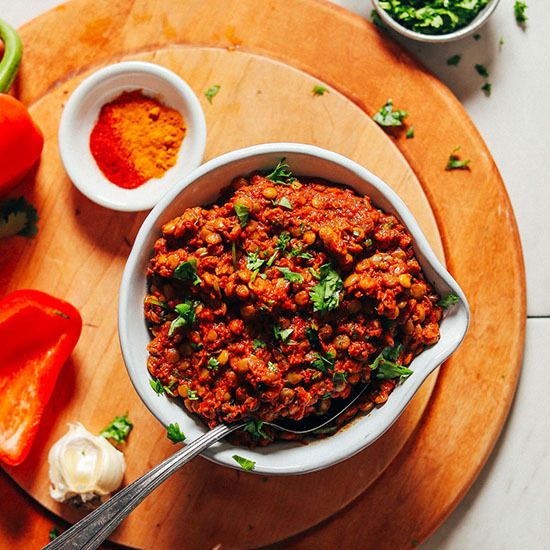 You’ll want to prepare the sauce while the lentils are cooking. Once the lentils have cooked, drain off any excess liquid and then add spice mixture and parsley or cilantro and mix well to combine. Hope this helps! I used to shy away from recipes that had a lot of ingredients that we don’t normally have at home (in the Philippines). But your hummus recipe (which my husband loved) inspired me to try cooking with an adventurous spirit. This turned out great even if i had a few missing ingredients (bell pepper, paprika, ginger, coriander, herbs). I cooked everything in a large pot (I made 2.5x the recipe using a whole bag of lentils). I’ll be bringing this to our family potluck lunch tomorrow. Planning to add some herbs and lemon juice to finish it off before serving. Hoping it will be a hit! Thanks very much for this, love the spicing! I actually got 3 meals out of it: first as a main dish with roasted eggplant and sweet potato on the side, then as the main filling of a veggie wrap (used radicchio leaves :) ) and I just had the remains as a pasta sauce with mushrooms and a garlicky avocado paste on top. Will definitely make this again! I think I did something wrong, as the vinegar was overpowering. I used this in the stuff eggplant dish, but will need to do something with the remaining lentils so I can enjoy them. Followed everything to the letter except the sugar. Just wishing I had not included the vinegar. I might add spinach as I read someone else had done. I definitely want to try it again though. My version tonight was 3* and hopefully I will end up with a 5* next time, so I will leave a rating of 4* to balance it out. I loved this recipe, made it twice two weeks in a row now and I just can’t get enough. I’m a vegan and my partner is pescatarian but he eats his meals with me and he said this was one of the most filling and delicious vegan meals he’s ever had :) pleasing all eaters with this one! Thank you. Yay! We’re glad to hear that, Charley! Delicious! I don’t have a good blender or food processor so I just made the sauce as a sauce, sauteed the onion, garlic, bell pepper with the spices, added a little frozen spinach, and then cooked the (canned) lentils in the sauce. It was smoky, earthy, and spicy, just the flavours I was hoping for. I forgot to add sugar but I think it worked well without it. I had some extra lemon wedges on the side, too. I made this tonight. What a quick and tasty weeknight meal. Extremely flavorable and makes you want to go in for another bite. I like it because it’s so healthy and has amazing flavor! Thank you! I am a big fan! I forgot to mark 5 stars! I followed the recipe to a T and it turned out perfect! ?? Very tasty and easy to bring together. My mistake was to use fresh ginger because that’s what I had on hand. It altered the flavor too much. When I make it again, I will skip the ginger altogether. Thank you for the great recipe! I have a question. If I use a whole bag of lentils do I double the recipe? It all depends on the size of your bag of lentils! This recipe calls for 1 cup (192g) of green lentils, so depending on how many cups of lentils are in your bag, I would adjust the rest of the recipe accordingly! This seems like it would be pretty spicy. What would you say for someone who’s tolerance only goes as far as say, black pepper? Hi Jennifer! I would cut the amount of cayenne down if you’d prefer a milder dish! I love lentils and how they can work with just about any cuisine! I really loved this recipe but I roasted the red peppers before pureeing them. It was phenomenal! I also used harissa powder instead of cayenne because it is what I had on hand. My plan was to make your stuffed eggplants but, in the end, I placed a slice of grilled eggplant over a heap of herbed quinoa and used the lentils as a sauce. I never fail with any of your recipes! this recipe is a show stopper, for sure. i used spicy smoked paprika, which at 1TBS, is quite a kick, when you add the cayenne as called for, as well. It definitely took a little more time than 30 min, but not much. I only used 1TBS of maple syrup, but I think next time I would do the whole 1 1/2 without a problem. I did all cilantro, but that’s also because I served it with brown rice that had a ton of freshly chopped parsley in it. Everything else I did as per the recipe, and I think it is wonderfully complex. I look forward to making it again, but I have a feeling that won’t be for a while, since I have so much leftover!!! Amazing and sooooo flavourful! awesome recipe!!!! Hi, I have cooked green lentils on hand. Do I use one cup of cooked green lentils for this recipe? I am not sure if that measurement is for dried or cooked. Thanks so much! Hi! You can use cooked lentils! We’d recommend 2 1/2 cups cooked. Do you cook the canned lentils the same way as dry lentils, boiling in 2 cups of water and then simmering for 20 minutes? Nope! Lightly rinse them and then well drain! If you are using canned lentils, they have already been cooked. I made this today. I did sauté the shallot and garlic, then added the tomato paste and cooked for a couple minutes and then added spices and cooked for a few more minutes. Even with these extra steps, I was able to make the sauce while the lentils cooked. I used maple syrup as my sweetener. I doubled the recipe. Served with baked sweet potato and peas. Had plenty left for freezer meals. We thought it was delicious and will definitely make again. Could certainly use the sauce for rice, quinoa or chickpeas! Thanks for the recipe! I’m so glad I have leftovers!! I made it in the Eggplant Boat style instead of roll ups. Very delicious and super filling. I made this for the Moroccan Lentil Stuffed Eggplant, and this is definitely a recipe I will keep in reserves. I had some guests over today and i made this as a side dish. I sauteed the onions, garlic and peppers. I also added a bit of water to make it more runny/saucy. I followed the rest of the recipe to the dot and it turned out great. Everyone loved it. Will definitely make it again. 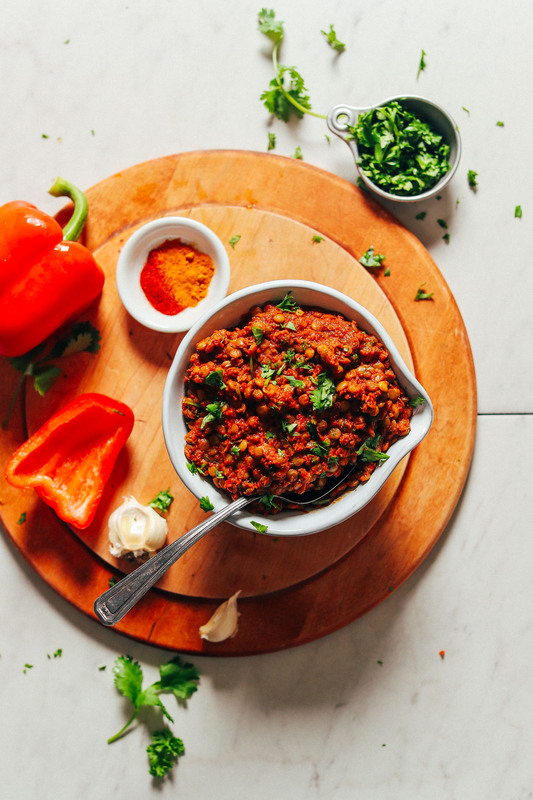 These were awesome…my new-favorite lentil dish. I love the spicy sauce so much that I’m thinking how versatile it will as a quick way tospice up black or pinto beans. I wilted in some fresh greens at the end which probably took the raw garlic/shallot down a notch, and found the spice level just perfect. So quick and flavorful! Thanks Dana! Just made this. I pureed the garlic, onion and spices, then sauteed it for a few minutes in a nonstick pan before adding the cooked lentils. This retains the consistency while also ‘cooking’ the onion and garlic. Delicious-thank you. I made this for dinner tonight. It was delicious. I have small children and they don’t like flavors that are really strong. So I roasted the red pepper, garlic and shallots before I put them in the food processor. I didn’t have to add coconut sugar because the roasting provided the sweetness. It turned out really good. The whole family enjoyed it. Just had this for lunch, yum! I added some coconut milk at the end & warmed the sauce through with the lentils. I agree there was a slight bitter taste, but I don’t think it was the vinegar… Also, it doesn’t serve 6 in our family! More like 3-4. Easy& quick to make. Thanks for another great recipe. Sauce can go pretty much for everything! This was delicious! A few modification: like many other people, I sautéed the onions and garlic before adding. I substituted the coconut sugar for date caramel because I’m avoiding added sugars- worked perfectly. I actually would have preferred it less sweet. Inspired by someone else’s comment, I sautéed some carrots and the other half of the onion I used in a pan and added the sauce and lentils to them and heated it together as my last step. Served it on top of some Wasa crisp bread (I do this with practically everything though). Thanks! Came out horribly. Thin, liquidity, no flavor. Not sure what I did wrong. Oh no! I am sorry to hear that, Molly. Did you change the recipe or leave out any ingredients? Let us know so we can help figure out what went wrong! I will try it again when I have peppers. Have been very happy with everything else on your site. The one pot lentil soup was so delicious. Keep the great recipe coming!! I made this a few weeks ago for meal prep for the week and it has to be one of my favourite recipes I have ever made. I feel like this dish is so versatile that you can use it for so many different things. I wouldn’t leave anything out of this recipe, AMAZING!!! Would this work when you first roast the bell pepper until it goes black? It should still work, but will change the flavor slightly. Hope this helps! Hi, Dana. Would this work as a taco filling? Hi Courtney! We haven’t tried it, but if you do let us know how it turns out! This looks so intriguing and I would definitely try making it. However, I couldn’t have onion and garlic. Are there some substitutes you would recommend? Or I could simply skip them? Thank you! You could skip them, but it will obviously affect the overall flavor but will work out fine still! Hope this helps! Made this last night. Didn’t have any maple syrup so substituted with a little soft light muscovado sugar. I also sautéed the onions and garlic a little first, and then added the spices to cook off for a minute or so. In my experience, raw spices can have a bitter aftertaste. It was very good indeed! Thank you! Going to try the stuffed aubergine with it tonight. Super yummy! I cut the cayenne in half and still had plenty of spice to suit us. I recommend starting with a couple of dashes and adding as desired. And next time, I’m going to roast the peppers for added depth of flavor. Oh, I nix any sweetener whenever possible, so no maple syrup. Sugar is for dessert! We ate this on corn tortillas with sprouts, chopped tomatoes, and a slice of avo…? Really good! I reduced the spices because I’m sensitive to them. but next time, I will use the full amounts, as they get diluted with the lentils. I cooked all of the sauce and put it over warmed up lentils. I used canned fire roasted tomatoes, as needed for a saucy sauce. Thank you. I have been enjoying the carrot apple muffins and this is my first main dish! Also I hate cilantro (i’m one of those people…I know) so i just left it out and it was great! If using canned lentils can they just be added to the food processor with the other ingredients or do they need to be heated first? Hi Shannon! If using canned lentils follow the recipe like you normally would, just lightly rinse them and drain well! I don’t really tolerate raw onions – do you think it would be ok to saute the onions before doing the sauce (obviously changing the taste slightly!)? I intend to use these for the stuffed eggplant – maybe the cooking time there would be sufficient? Thanks for any advice! Hi Rachel! If you are ok with using it, then that should be fine! I wish I just didn’t add the maple syrup – I added less than the recipe and still found it way too sweet. I tried to balance it with lemon and apple cider vinegar but it wasn’t enough. Made this last night…super yummy! Have you ever used Toor Dal (lentils)? This was delicious! 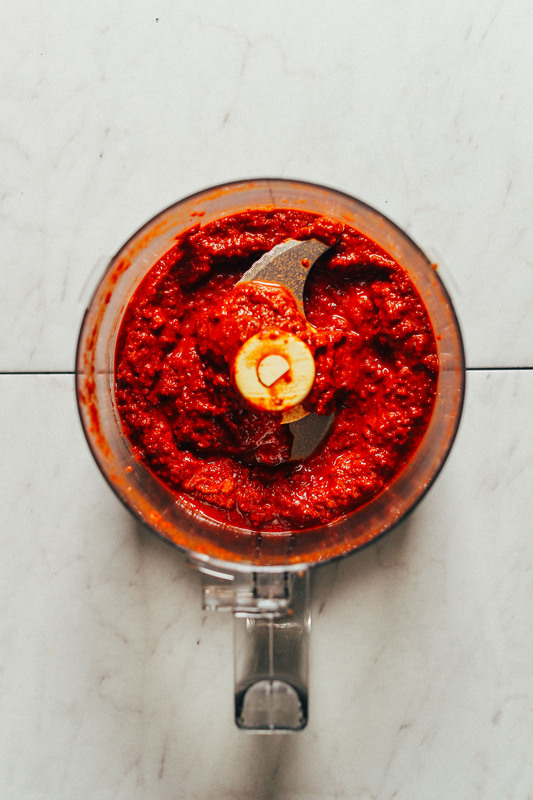 But I love harissa, so this saucy adaptation was perfect. I served it with rice. I also had a bit of avocado sitting around that I decided to add. Random, perhaps, but it was actually SO good. Hi Sam! We haven’t tried it, but if you do let us know how it goes! I made this twice. The first time I made it as written, except that I accidentally used Italian Style tomato paste. It was awesome. The second time I used regular tomato paste, and sauteed the onion and garlic. It was good, but I like the first one better. Great idea, looking forward to trying curried lentils next! I made this for lunches this week with red quinoa. Beautiful, flavorful and filling. I cooked the onion up a bit like others and went for cilantro. This will definitely become a lunch staple. So good!! Do the lentils need to be soaked overnight? Hi Natalie! They don’t need to be soaked overnight! Perfect for a quick weeknight dinner. Delicious! I made this and found it to have an unpleasant bitter taste to it. So I just decided to make a morrocan curry out of it, adjusted the spices and added coconut milk. It ended up tasting pretty good serverd with rice. Although you don’t technically need to with green lentils, soaking them for a few hours or overnight before cooking might help. I also sautéed the onions and garlic as those raw can have a similar effect! Beano! Saves the day for vegetarians ? I’ve never gotten gas from lentils so I looked this up and it seems helpful! The probiotic rich thing is very true! Ever since I started having 1/4-1/2 cup a day of probiotic food, no food ever really causes me gas. And I used to struggle with it a lot (just not from lentils). Good luck! Also, Bean-o is not vegan, but Bean-zyme is, in case you are vegan. Have you tried cooking them in a pressure cooker instead of stovetop? It seems to help me when I cook beans and lentils in the pressure cooker. I used sprouted lentil trio & it came out really well.I left out the maple surup & did not miss it. I will prbably kick it up a notch with another dash of cayenne as we like spicey food. Putting in the recommened was a little tame for me. The tomato past & cider vinager gives it a nice bite. I blended my parsley with everything else also. Great recipe! Something out of the norm. Can this dish be frozen for later use? This recipe reminds me of muhamara! Wouldn’t some walnuts be great with it?!?! This is just delicious! I’ve made it twice in one week. I did put some carrots in for color and crunch and the second time I used the lentis as a stuffing for acorn squash. I added a little feta at the end, just before serving. My husband thought it was so pretty, he took a picture and sent it to friends. My son loved it. Thanks for this terrific recipe. Hi! I really loved this recipe! It was great over cauliflower rice! The only changes I think I’ll make next time will be to add more tomato paste just to make it more saucy., And half the Cayenne. It’s spicy enough for me but he huns won’t eat it. I made this for a new year’s eve party and it was a big hit! I made a few changes though. The big one is that like many others I made it a cooked sauce rather than raw. Specifically I sautéed the garlic and spices for a bit in some oil, then added in everything else as a rough chop and then pureed it with an immersion blender. When i ate these the next day they tasted quite bitter, what could this be? Hmm, perhaps the vinegar? You could simply try scaling back next time! The parsley on this fabulous looking lentil concoction makes the dish for me. Can’t wait to try it. Just tried this recipe for the first time tonight and it’s definitely become a new favourite! Amazing flavours and so good with the red pepper especially. I did use raw onion and garlic but I’m gonna sauté them in a pan first next time before blending. Definitely got that strong aftertaste that I personally didn’t like but wanted to follow the recipie first to see how I found it! Was still very happy with how it turned out otherwise! Really looking forward to see what you’ve coming next! I’m getting a taste of something bitter. Any idea what this could be from? Probably the apple cider vinegar or lemon. If you find it too strong pull back next time, or compensate with a bit more spice, salt, or sweetness. I have made this , without tomato paste because I did not had any! 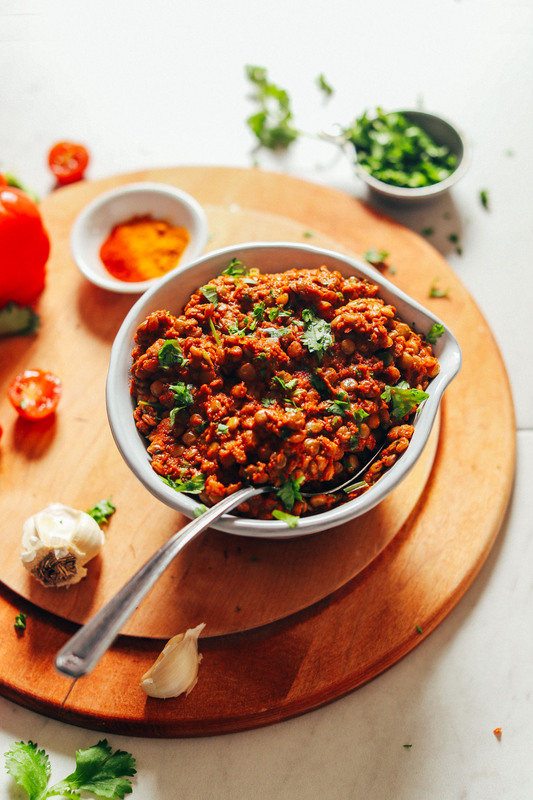 turn out a delicious lentils salad, with morrocan taste!! Delicious! I made this tonight and would agree that it tastes AMAZING!! and that pan frying the shallot and garlic first would be nicer. I did not have a small amount of tomato paste, but did have oven roasted tomatoes from the garden that I used instead. I also used fresh ginger. WOW did this taste great! Thanks for the tip! Glad you enjoyed it! I just made this with black lentils, and it’s delicious! Perfectly smokey and spiced just right. Thank you for your inspirations. I used up the rest of my brown lentils and needed more so I added black lentils and made this with a mix of the two. It is SO. GOOD. Served on quinoa with wilted garlicky greens. I feel like the bowl needs another vegetable but I don’t know what to add that won’t sort of clash. Avocado definitely feels wrong. Fresh tomato doesn’t seem quite right. Maybe roasted cauliflower? Great dish! I used fresh ginger and tumeric. Next time I would panfry the onion and garlic before mixing. The raw taste was a little too strong for me. I just finished making this. It’s AMAZING!!! It’s exactly what we needed after coming back from the Florida Keys. We ate far too much unhealthy food but still wanted to indulge. This recipe is perfect for that. Spicy and sweet. I also love the use of green lentils. I’m always looking for interesting ways to cook them. I paired this sauce with Thai jasmine rice. I think it would be great with white fish as well. I will definitely be making it again. Thanks for creating this and your hard work in posting it. I made this last night for dinner. Got out the HUGE saute pan and browned chunks of carrot, celery, onion & cauliflower. When the lentils ( cooked separately) were ready i added them with the sauce to the veg and it came out perfectly. To give some warmth and sweetness, I added a touch of cinnamon and finished with cilantro. My husband loved it and said, “Put this on the hit list!” We ate this along with a salad. Thank You! With all the preparations for the holidays, it’s harder to come up with a quick dinner…or I just lose interest in cooking and would rather bake. Ha Ha! Nope! Just add to the pan with the lentils! I made this just now and it is absolutely delicious! So simple and quick to make. I added a little bit of water to the sauce to make it more runny. And also a couple spoons of olive oil at the end to make everything nice and shiny. Thank you for the recipe!! Should the sauce be cooked beforehand? Or should the vegetables be sauteed first before putting all the ingredients in the food processor? Nope! They can go in raw. Great recipe. Lentils are starting to be my go to. RE: red lentils. They would be great if you made this with chick peas and red lentils. That, along with salad and some nan or pita would make this a fine main dish for dinner. You are going to be my new best friend! My Doc tells me I gotta diet, and the book I have says vegan , vegan , vegan. I love lentils and your creative use 0f seasoning. I know I won’t be able to eat everything you publish, but from what I have read so far, many things will be perfect for me. Looking forward to a great partnership! that looks amazing. I will try it, first thing tomorrow! Perhaps i will add fresh mint instead of the parsil. I have the same question as Melissa. Can you use red lentils instead? Not impossible, but not ideal as they get mushy when cooked. So glad I came across your site. This sounds and looks amazing-can’t wait to try it. Your Mediterranean sweet potoate dish was a hit with my husband and friends! Do any kind of lentils do for this dish? Thanks Sara! See the above comments. Green and brown are best! This looks so delicious and comforting I just have to try it soon! These look so delicious and easy. Can’t wait to try. I have red lentils on hand… do you think I could sub? 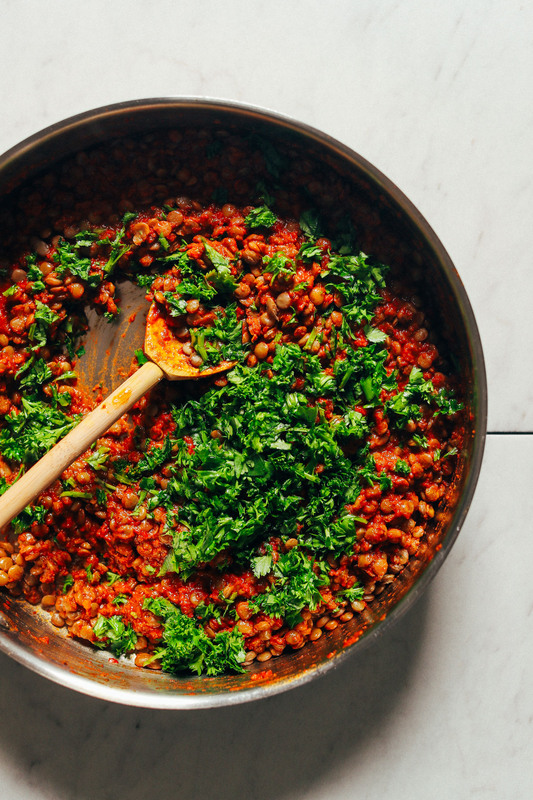 I use lentils quite often and the biggest difference I find between red and green is red becomes more mushy (which is great for Indian dishes such as red lentil dal) and the green holds their texture more. I would think for this dish you want them to maintain their texture more, so red would not be ideal. But they would probably taste okay. Hope that helps. I would agree with Mary. Not impossible but not ideal for texture. Melissa, I literally just finished making this with red lentils because I was too lazy to go buy green lentils. It is mushier but since I’m the only one eating it, I don’t care. But if you’re serving it too others, you would probably want to use green. I also had to use veggie broth to thin out the sauce a bit but all in all, it’s a good recipe. Next time I make it, I’ll reduce the cayenne pepper a bit. A little too spicy for my taste buds but for those that like some bite to their food, keep it as is. Thank you do much! I’ve got green lentils on my grocery list. Thanks for the other tips as well! I’m looking forward to making these.